It’s here, the most eagerly awaited gig of the year on leeside, and this was the case, even before The National made number one on both sides of the Irish Sea, with their 7th studio album, ‘Sleep Well Beast’. The people behind Sounds From A Safe Harbour Festival are responsible for bringing Indie-Rocks biggest name to The Cork Opera House tonight. Punters had frantically searched for tickets as pre-sale after pre-sale sold out within minutes. A large number of fans even gathered outside on the faint chance that someone may have had a ticket spare for the opening night of the Sleep Well Beast tour. The Sounds From A Safe Harbour festival made a lasting impression on the City of Cork after its maiden outing in 2015, as a host of international acts joined forces with a wealth of domestic talent to play in some unique venues and settings. Saint Sister come under the latter category and their announcement as support to The National was greatly received. Their brief set was gorgeous, as expected. The performance was slightly marred by crowd chatter but thankfully Saint Sister’s melodic mix of harp and synths, beautifully backed by wonderful, vocal harmonies won through in the end. ‘Madrid’ and ‘Blood Moon’ were excellent but it was ‘Corpses’, a song which was previously unknown to me, that I felt was their highlight. Before a note was sung the crowd were already in their element, as none other than Lisa Hannigan was introduced on backing vocals for The National’s sombre, show-opener, ‘Nobody Else Will Be There’. The second song of the set, ‘The System Only Dreams In Total Darkness’ sensationally upped the tempo and felt like it could have well been kept as a show closer. ‘Don’t Swallow The Cap’ and ‘Bloodbuzz Ohio’ follow in the same vein as lead singer, Matt Berninger erratically prowled the stage with the look of a man possessed. Justin Vernon, of Bon Ivor fame was next big name to grace the stage for an outstanding rendition of ‘Afraid Of Everyone’, complete with strings provided by Irish Act, Slow Moving Clouds. ‘Turtleneck’ was intense, to put it mildly and ended with Berninger repeatedly clonking himself on the head with his microphone while Vernon and the Dessner brothers rocked out on guitars. Lisa Hannigan re-joined the cast for the gorgeous ‘I Need My Girl’ which calmed down proceedings significantly, and gave Berninger’s head brief respite. One of my own favourites, ‘Slow Show’ sounded superb live, as did ‘Fake Empire’, ‘Green Gloves’ and ‘Apartment Story’ which all featured on their brilliant, 2007, record, ‘Boxer’. A trio from their excellent new record followed their little nostalgic trip as ‘I’ll Still Destroy You’ proceeded the excellent ‘Guilty Party’ and the gorgeously, heartfelt ‘Carin At The Liquor Store’. A four-song encore followed a short break and consisted of the beautiful ‘Born To Beg’ and new single, ‘The Day I Die’, before a thumping version of ‘Terrible Love’ had the crowd chanting along in unison. This amazing show ended with a gorgeous cover of Cat Power’s ‘Maybe Not’ beautifully assisted by Lisa Hannigan and some other SFASH festival contributors. 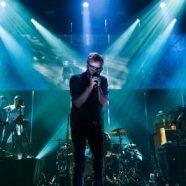 The National are at the peak of their powers and the numbers prove this; their number 1 slot in Ireland and the UK coupled with their loftiest position in the US charts to date, enforce their position as Indie-rock’s leading light. Isn’t it funny how the charts seem to only become relevant when it’s your favourite band sitting at the very top!